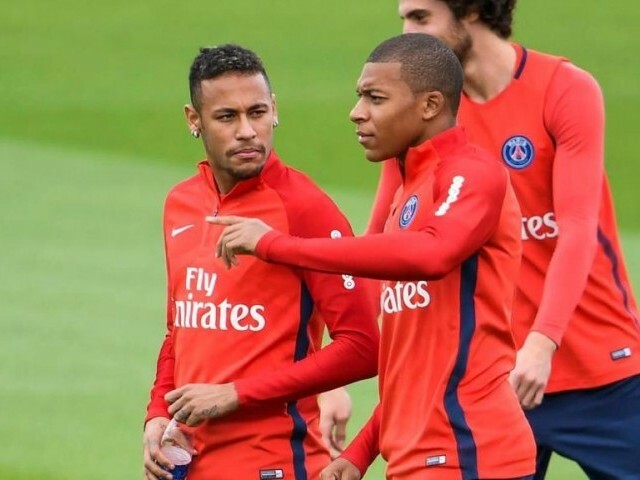 PARIS: Neymar left Barcelona for Paris Saint-Germain 12 months ago in a bid to move out of Lionel Messi’s shadow and confirm his status as one of the world’s best players, but the Brazilian may have to share the mantle of talisman with teenage prodigy Kylian Mbappe this season. The French champions start the defence of their Ligue 1 title against Caen at the Parc des Princes on Sunday, and all eyes will be on Neymar after he missed the final three months of last term with a foot injury. Neymar returned in time for the World Cup, but failed to inspire Brazil to a record-extending sixth title as they suffered a 2-1 quarter-final loss to Belgium. Mbappe, on the other hand, was named as the tournament’s best young player after scoring four goals — including two in a scintillating individual performance against Argentina — to help France lift the trophy. The transfer fee of €180 million which PSG paid Monaco for Mbappe is not far behind the world-record €222 million they parted with for Neymar. New arrival Gianluigi Buffon believes that Mbappe can follow in Pele’s footsteps by becoming an all-time great, having played against his then-Monaco team in the 2017 Champions League semi-finals for Juventus. “When I spoke (after the match) with (Juve centre-back) Andrea Barzagli, who is one of my great friends, he told me ‘Gigi, in 20 years of my career I have rarely seen a player run so fast with the ball, I had a hard time stopping him’,” the 40-year-old Buffon told PSG’s club magazine. Further accolades seem sure to follow in the coming years for Mbappe, who was named on the 10-man shortlist for FIFA’s ‘Best Player’ award for 2018, with Neymar conspicuous in his absence. But the 25-year-old Neymar, despite criticisms over his playacting at the World Cup, did perform on the pitch last season, scoring 28 goals in 31 appearances for PSG before breaking a bone in his foot against Marseille in February. Neymar will likely want the spotlight, but his best chance of leading PSG to their stated goal of a first Champions League title will be to replicate his famous combination with Messi and Luis Suarez at Barcelona with Mbappe and Edinson Cavani.